There’s a suppressed science correlating cell phone use with cancer risk. It is suppressed because the health risks pose a basic threat to the business model of the booming cell phone industry, with looming regulation and a devastating spate of future law suits. In defense of the scientific community, I hasten to add that there was no reason to suspect in advance that radio waves would have any biological effects whatever, based on well-established and conventional notions of how biochemistry works. But the epidemiological evidence has been compelling for several years now, and it’s past time for the community to turn around. Last week, data from a major study were released confirming our worst fears. This was based on rats, not humans, so all the provisos about indirect evidence and correlation vs causation don’t apply. Rats live just two years, so the exposure time was short compared to humans. They chronically exposed rodents to carefully calibrated radio-frequency (RF) radiation levels designed to roughly emulate what humans with heavy cell phone use or exposure could theoretically experience in their daily lives. The animals were placed in specially built chambers that dosed their whole bodies with varying amounts and types of this radiation for approximately nine hours per day throughout their two-year life spans. Despite the short duration of the experiment and despite the fact that there were only 90 rats in each group, cases of rare cancers were reported in the test rats, but none in the controls. An interesting twist in the results is that there is a hint that rats exposed to cell phone radiation lived longer. There is precedent for this in many kinds of hormetic experiments. For example, intermittent, low levels of ionizing radiation cause an elevated cancer incidence, but for those that don’t get cancer, there is a small tendency for increased life span. Is this a big cause for concern, or a tempest in a teapot? Quantifying the risks for humans remains very uncertain. For humans, there are no precise measures of exposure, and for rats, we don’ know how to translate the results to human terms. This kind of uncertainty combined with huge economic stakes leads inevitably to strong language and exaggerated claims on both sides. For me as a consumer, this has been a subject about which I’m happy to hide my head in the sand. When I’ve been forced to think about it, I’ve concluded that cautionary measures are warranted, but I’ve been slow to follow through. Another big topic which I don’t want to think about is the speculative effect of cell radiation on neural activity–thought in the present moment. Does cell phone radiation affect concentration? Productivity? Headaches? My best guess is that there are some people for whom these effects are a palpable reality. …so let me take this opportunity to make a public commitment to do at least the easiest things in precaution. We can take advantage of the fact that all radiation falls off steeply with distance from the source. A huge transmitter on a tower half a mile from your home yields much lower radiation levels than a single cell phone transmitter that is half an inch from your brain. Always use cell phone with headphones or on speaker phone, well away from the head. Get the wifi hubs in your home and office off your desk, and keep them on the opposite side of the room from your workspace. Install wired connection for your laptop so the computer that is closest to you doesn’t need wifi for your daily usage. This much is easy, and it is a minimum. I don’t for a moment mean to imply that it is irrational to do much more to safeguard our bodies and our families from microwave radiation. I’ve already said that there are powerful theoretical reasons to believe that low-level radio waves should have no biological effects. We now know that there’s something amiss in those powerful theories. For more than a century it has been a foundational assumption of biology that living cells are no more than very complicated chemical reactors, and that the fundamental mechanisms of biochemistry are one with the fundamental mechanisms of inorganic chemistry. I daresay we now know this not to be true. Life is playing some special tricks that non-living bags of chemicals don’t play. It would be overreaching to go back to the 19th Century notion of vitalism; my bets are on quantum processes at the single-molecule level. I learned just last month that visionary biophysicist Stuart Kaufmann has been writing about this subject. I predict that Quantum Biology is the next revolution. True, but that’s not really the relevant question to ask. In fact, aging has a major impact on mortality in the wild, and this poses a dilemma for evolutionary theory. In the earliest stages of senescence, already an individual may be losing its competitive edge. When an epidemic passes through, those with compromised immune function are the first to die. When a predator is chasing the herd, those that cannot run quite as fast as they used to are caught at the back of the crowd. In this way, aging can have a big effect on fitness even if no one is “dying of old age”. In 1951, Peter Medawar put forward the first modern theory for the evolution of aging. He was a self-made Brazilian giant, 6 foot 5, as charismatic as he was brilliant, and at the age of 36 he had achieved a prestigious appointment at University College, London. For his inaugural address, he chose to tackle an Unsolved Problem of Biology, and asked how aging in nature could be reconciled with Darwinian evolution. Medawar proposed the theory that natural selection can only work on living, reproducing individuals. But in the wild, there are so many hazards that can lead to death that, past a certain age, there are very few remaining alive. In nature, everyone dies before they reach old age. This creates a “selection shadow”. Bodies are evolved to be healthy, strong or fertile up to the age where there are still survivors in nature. But at advanced ages, natural selection has never had an opportunity to work her magic, so we should not be surprised that the organism is ill-adapted and falls apart. We get old and die because of evolutionary neglect. Natural selection needs living, reproducing individuals to select from, or it is ineffectual; hence we expect that aging takes over and the body deteriorates soon after that age at which predators and disease and other hazards of the wild have thinned the population near to zero. Very quickly, Medawar’s idea was enshrined in the canon of evolutionary theory. Building on Medawar, two more ideas were added. One was the concept of “mutational load”. If there was no natural selection at work for “late-acting genes”, then random mutations would creep in, and this would account for the organism going to pot. This became the Mutation Accumulation theory. The other was the idea that selection at late ages may be weak but not zero, and it could then be overpowered by the drive to maximize fertility early in life, even if it had bad consequences for fitness later on. This became the Antagonistic Pleiotropy theory. The idea that, in the wild, no one lives long enough to die of old age made a great deal of intuitive sense. George Williams (of the pleiotropy theory) added a refinement: that the early stages of senescence would likely have consequences for individual competitiveness, so he based his theory on the idea that selection against aging was weak but not zero. But everyone was agreed that the fitness consequences of aging were very slight, if not actually negligible. Evolutionary theory went on to develop on this basis, and continued to be embellished for 40 years. The inconvenient truth came to light gradually, and several decades on. In physics and chemistry, experimental science is an attractive calling because practitioners get to hang out in a lab and perform magic with nifty apparatus and spiffy electronics. But experimental ecology is a field science requiring travel to remote locations, and many lonely, patient hours of observation, away from the comforts of home. The work is often left to doctoral students who are in no position to protest. 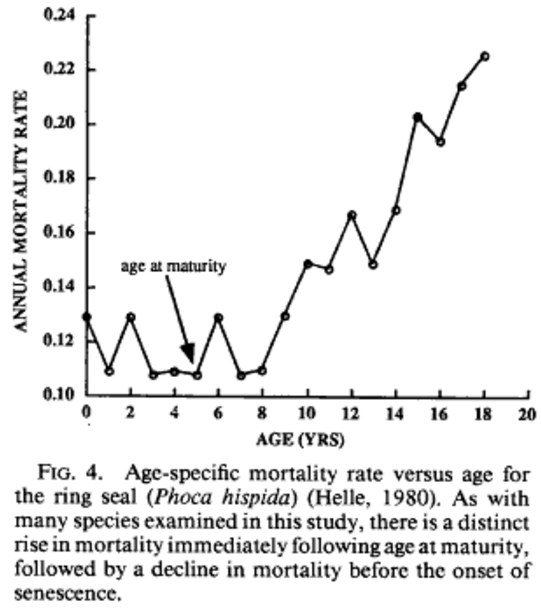 So it was 25 more years before evidence started to accumulate that could bear on the question, how many animals in the wild are dying from the (early) effects of aging? How to interpret the results? If there were no aging in the wild, then we must expect that the percentage of individuals dying at every age is the same. But the number remaining gets smaller and smaller, so the absolute number of deaths would go down with age. The math tells you that “no aging” corresponds to a falling exponential curve. If the number that we actually find is flat with age, or even if it declines with age but not as rapidly as an exponential curve, this is evidence that aging is taking a toll on fitness in the wild. It was 1991 before Daniel Promislow first collected and interpreted the appropriate statistics for 56 different mammals in the wild. He was a doctoral student at Oxford, and this study launched his career. In 46 of the 56 species, he found an increasing risk of death with age. In several species, data were complete enough that he was able to detect a Gompertz curve, meaning that for a given individual, risk of death climbs exponentially with age. The Gompertz shape of the mortality curve had been known for 150 years—nothing new there. The surprise was that previous to Promislow, scientists had thought that the Gompertz shape only applies in protected environments, like humans in civilization and animals in zoos. In the wild, it was expected that (according to Medawar) everyone dies too early to see the rising shape of the Gompertz curve. The significance of these results was not lost on Promislow. He boldly asserted that his results conflicted with the accepted evolutionary theories for aging. He was also modest and tactful enough to allow for reasons that his conclusion might be premature, and that adjustments could be made to permit the evolutionary theories to hold their own. In 1998, Robert Ricklefs expanded on Promislow’s results by including more mammal surveys and some birds. Ironically, he titled his piece Confirmation of a Fundamental Prediction, but in fact the results made all the extant theories for evolution of aging quite untenable. He fitted mortality curves for each of the species in the study, and reported parameters from these curves. From these data, it is a small further step to answer the question, What proportion of deaths in species can be ascribed to aging? Ricklefs set up the equations and provided all the parameters, but he never completed the calculation. 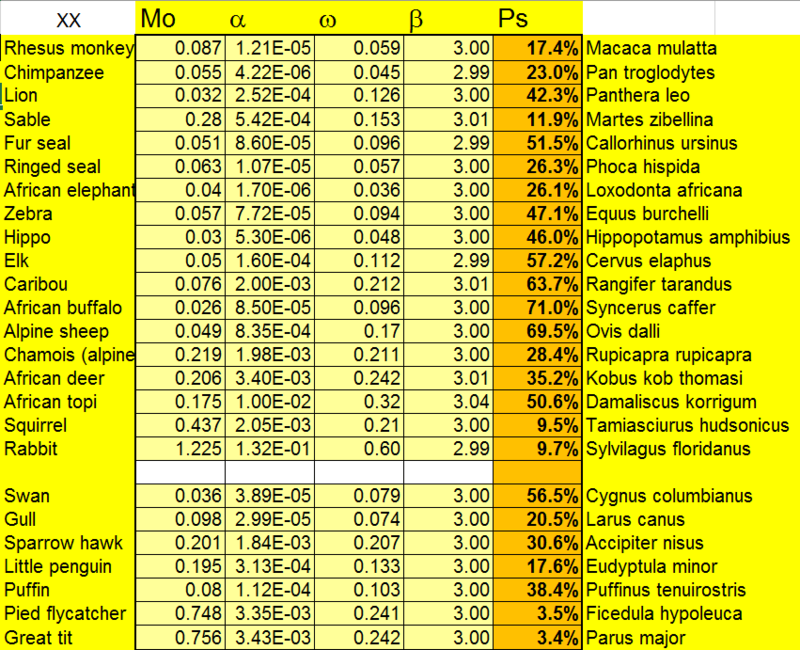 Later, I filled in those numbers, the “percentage of senescent deaths” for each species. You can read them in the column highlighted in orange. As you can see, there are no animals for which the impact of senescence in the wild is negligible. Many are clusted in the range 15-30%. Some are over 70% — meaning, roughly, aging is reducing fitness in these species by more than 2/3. All the above work is based on field studies, data compiled after the fact through searching for remains. But the cleanest kind of study would be an experiment, planned in advance, where individual animals could be tracked in the wild and their fates determined by direct observation. As a Canadian grad student in the early 2000s, Russell Bonduriansky set himself the daunting task of individually labeling, releasing, and recapturing thousands of antler flies to answer directly, how did their risk of death change with age? His doctoral work was stunning enough to be profiled in Nature. The result: 28% of antler fly deaths were due to aging. The numbers above present a dilemma for evolutionary theory. Scientists dealing loosely with this question sometimes say, animals die once their fertility is ended. It’s no surprise that evolution has permitted these animals to age and die once they have reproduced and replaced themselves. But the theory can’t escape so easily, for two reasons. Second, responding to the argument about “once they have replaced themselves”… We should note that this is a flat denial of the dominant “selfish gene” view of evolution. In standard evolutionary theory, there is no such thing as “enough”, because individuals are in an arms race to dominate the next generation with their genes. If I have 6 offspring and you have 7, it will not be very many generations before my descendants are completely crowded out by yours (according to the way standard evolutionary calculations are performed). This perspective highlights the evolutionary paradox that natural selection has tolerated declining fertility and increasing mortality in so many different animal species. Sixty years after Medawar, it is untenable to maintain that aging exists in a “selection shadow”. The negative consequence of aging for individual fitness is a force to be reckoned with. But theorists have yet to face this particular monster. I still hear Medawar’s hypothesis cited as gospel regularly in papers and at conferences. The disconnect between theory and observation is stark. The idea of “late-acting genes” made sense in the 1950s when Medawar and Williams were formulating their theories, but we now know that all living things have extensive machinery (epigenetics) for deciding when to turn particular genes on and off. Williams imagined that if a gene is beneficial at one stage of life, we would be stuck with it at another stage, when it is detrimental. We now know that genes are routinely turned on and off as needed. The idea that fitness depends on maximizing the number of offspring is enshrined in standard evolutionary theory, which is the “selfish gene” model. But there are many ways we know this cannot be right. Producing too many offspring can be just as disastrous for a species as producing too few. This is the inspiration for my Demographic Theory of Aging. Last week, I attended the tail end of a Keystone conference on Epigenetic Regulation of Aging, followed by a one-day brainstorming session to kick off a project called GILGA-mesh, intended to take this bull by the horns. Though the subjects of the two days were virtually identical, the approach and attitudes of the scientists in attendance set very different tones. Both days featured smart, creative and careful scientists, but they saw the same material through different frameworks. Sometimes philosophy makes a difference. For readers who know me less well, I should introduce my perspective: I believe that aging is an evolved epigenetic program. When we are young and growing, particular genes are turned on and off with exquisite timing to determine the growth and development of bones, muscles, and organs. When we are old, the program continues, more slowly and more diffusely, but inexorably nonetheless. Genes are turned on that destroy us with inflammation and cell senescence and auto-immunity and programmed cell death, while the systems that protect us from pathogens and from free radical damage are gradually shut down. Evolution has left nothing to chance. [I first wrote an academic paper about this idea in 2013, excited by a paper by Aviv Johnson on methylation, but unaware that Tom Rando had written on the same lines the previous year. Jeff Bowles had hinted at similar ideas in a paper more than a decade earlier. Soon the field was broken wide open by the work of a bio-statistician. Epigenetics is a new science in the 21st century. All the cells in one body have the same DNA (pretty much), but differernt genes are “expressed” (translated into proteins) in different tissues and at different times, and this is what controls the body’s metabolism. In fact, only 2% of our DNA is genes, and 98% determines how the DNA is folded and spooled, opened and closed at particular times and places, and this in turn controls gene expression. We are 2% genetic and 98% epigenetic. There is a language called the “genetic code” which determines how genes are translated into proteins. It was decoded by Francis Crick and others in the 1950s. It is as simple as it can be, and is completely understood. There is another language, the “epigenetic code” that determines gene expression. It is anything-but-simple, with a convoluted and self-referential syntax that we are just beginning to understand. The epigenetic code starts with signals embedded in the DNA that serve as “start” and “stop” codons. The stretch in between comprises a piece of a gene, a kind of Gutenberg movable type that is transcribed from the chromosome and then spliced and combined to form functional RNAs and proteins. The complicated part of the epigenetic code is implemented as a pattern of methyl and acetyl groups. These are little chemical decorations that attach to the DNA and to the “histones” (spools around which DNA is wound up in the cell nucleus for safe storage). The methyl and acetyl groups are continually being attached and removed according to instructions that come from within the cell and other instructions that are passed through the blood. It is the methyl and acetyl groups that determine how the DNA is folded and spooled, which effectively turns particular genes on and off as needed. The part of the epigenetic code on which we have the best handle at present is called “methylation of CpG islands”. Long stretches of DNA have CGCGCGCG… on one strand, complemented by GCGCGCGC… on the other. Often the C’s in this region get an extra methyl group, turning from cytosine to 5-methylcytosine. Then this stretch becomes a “repressor region,” a signal to NOT express the adjacent gene. DNA methylation can be persistent, turning a gene off for decades at a time. When a cell divides and its DNA is copied, the methylation pattern can be copied with it. This accounts for some of the persistence of epigenetics, and the way gene expression can be inherited across generations. DNA methylation has been appreciated for 30 years, but two recent developments make the subject attractive and accessible to research. (1) There is now a simple lab/computer technique for reading the methylation pattern from DNA. It relies on commercially available, automated machinery for PCR to sequence a full genome before and after chemical modification of the methylated C’s. (2) There is now a simple lab/computer technique for changing the methylation state of any chosen target site in the DNA. It is based on CRISPR technology that is taking genetics labs by storm the last two years. Is epigenetics a cause or effect of aging? The correlation between aging and epigenetic status is established beyond dispute. But what does it mean? This is the big question. Most researchers think of the body as programmed by evolution to be as strong and healthy as possible. So, when different genes are expressed in old age, they find it natural to assume that the body is protecting itself in response to damage that it has suffered over the years. We express different genes when we are older because we need different genes when we are older. This was the predominant attitude at the first conference (where I was present just for the last day). The other possible interpretation is my own, and it has become common among those who are closest to the field of epigenetics. It is that epigenetic changes with age are means of self-destruction. The body is programmed to die, and its suicide plan is laid out in the form of transcribing an unhealthy combination of genes. This idea flies in the face of traditional evolutionary theory. (How could natural selection prefer a genome that destroys itself and cuts off its own reproduction?) Nevertheless, the evidence for this hypothesis is robust. The genes that are turned on don’t protect the body—quite the opposite. Genes for inflammation are dialed up. Genes for the body’s defense against free radicals are dialed down. Cell turnover is dialed down. DNA repair is dialed down. The mechanisms of programmed cell death (apoptosis) are strengthened in healthy cells, at the same time that they are perversely weakened in cells that are a threat to the body, like infected cells and cancer cells. How will we determine who is right? parabiosis experiments provide a strong clue. Three researcher groups (at Stanford Harvard, Berkeley) have shown that injecting blood plasma from a young mouse into an old mouse makes the old mouse healthier, and relieves some problems associated with age. The blood plasma contains no cells—only signal molecules that are the product of gene expression. This is powerful evidence that youthful gene expression is supporting a strong and youthful body, and (conversely) that the kind of gene expression that characterizes old age is not doing the body any good. But the ultimate experiment will be to re-program gene expression in an old mouse and see if there is a rejuvenating effect. Repeat Horvath’s (human) analysis for mice. In other words, identify several hundred places where methylation is different in young and old mice. Look at the set of genes and identify transcription factors. These are likely to be “upstream”, in that they control other genes. Start with old mice. Use CRISPR to change the methylation status in a handful of promoter regions that control transcription factors, making them match the methylation status of young mice. Measure metabolic functions to see if the old mice are more healthy or less after these procedures. Look particularly for changes in inflammation, propensity for cancer, and especially life span. If this experiment goes as I expect, we will be ready for rejuvenation experiments in humans. How does the body know how old it is? Even further upstream, is there a central master clock that dictates the body’s epigenetic expression, and thereby determines our biological age? Logically, it seems that the body would need an accurate clock to time the events of growth and development. Evolution likes to re-use the parts she has created, and it would not surprise me if the developmental clock morphs into an aging clock. I have reasoned that there are two possibilities. It may be that there is a timekeeper, probably in the neuro-endocrine regions of the brain, that controls the processes of development and aging. This possibility is supported by works of Kasper Daniel Hansen and Claudia Cavadas. If this pans out, it would present the handiest target for true rejuvenation in humans. But it also may be that epigenetic expression itself is a kind of clock that is diffused through the body. Today’s gene expression includes transcription factors that control tomorrow’s gene expression, and so epigenetic state may be a feedback loop, or self-contained clock. This may also be a target for rejuvenation, but a little accessible, harder to address or to tinker with. encyclopedia of aging in 1990, and continues a very active research program today. From Finch, I learned that infections in childhood and even in the womb can have a serious effect on diseases of old age, decades after the fact. He hypothesizes a lifelong burden of inflammation. Evidence includes an elevated incidence of heart disease for the cohort born just after the influenza epidemic of 1918. I was chagrined to learn that air pollution, especially particulate matter, is associated with increased risk of dementia. This poses a personal dilemma for me, as I plan to spend the summer at the lab of Meng-qiu Dong in Beijing. I learned that hospital errors are the third leading cause of death in the US, accounting for about 10% of all deaths, about the same number as smoking. Maybe you already read that in the New York Times.